If you, like us, love strawberry shortcake, we have a killer tip for making ordinary strawberries great. I learned this tip from Food Schmooze® Senior Producer, Robyn Doyon-Aitken. 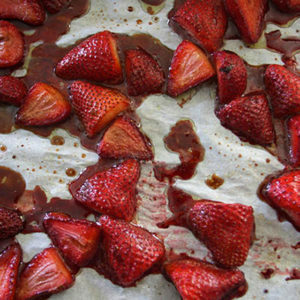 Put your clean strawberries on a rimmed baking sheet—it has to be rimmed, and lined with parchment paper. Bake the strawberries in a 350° oven for about 30 minutes. You could sprinkle them with sugar before baking them, but you don’t have to. Check them often, toward the end. The heat concentrates the flavors, and now you’ve got super strawberries—even in early-spring when everybody knows strawberries could use a flavor boost.